The state of North Carolina can be roughly divided into three major regions: the coastal region dominated by beautiful beaches, resort towns, and historical sites; the central Piedmont region which is more urban and contains major universities (with very enthusiastic basketball fans) and premier medical centers; and the western region, composed predominantly of small towns, three state universities (the student population of Western Carolina University in Cullowhee is essentially equal to the population of the town—both have around 9,500 residents each) and a strong history of preserving traditional music and crafts. The Blue Ridge Mountains located in this region get their name from the blue color the mountains exhibit when seen from a distance, a color produced by light filtering through the heavy haze of isoprene emitted by the trees in the region. The writers divide the area into seven regions, beginning in the north at the Virginia border and traveling down to the Georgia-South Carolina border with Tennessee an ever-present neighbor to the west. Each region gets its own coverage of geography, history, persons, and events. Highlights of special activities are provided for each area, as well as sources for further information. Blue Ridge Music Trails of North Carolina has much the same feel to it as the older Foxfire series documenting the history and folk traditions of the entire Appalachian Mountain region. Descriptions of activities and locale are interspersed with interviews of long-time residents and musicians who provide intensely personal connections to the places and music. The reader gets a much better feel for the area when reading about the individual histories of those involved in the communities. One of the interesting features of the book is the information about the various strands of musical tradition that are interwoven into the culture of the area. Not only was there a Celtic influence (seen in the ballads and fiddle tunes), but Native Americans and African-Americans have also made significant contributions to the regional music. Special mention needs to be made about a radio station highlighted in the book: WPAQ (740 AM, available also online). This station, located in Mount Airy, has been on the air since 1948 and features the best in traditional Blue Ridge music, mainly from performers in that area of the country. The station provides a healthy blend of gospel preaching, exciting music, and news of local happenings (including a weekly listing of funerals). The book by itself is a pleasure to read, but the accompanying CD immensely heightens the appreciation. Recordings are provided that illustrate the different music traditions described in the book, from fiddle tunes to shape-note singing. 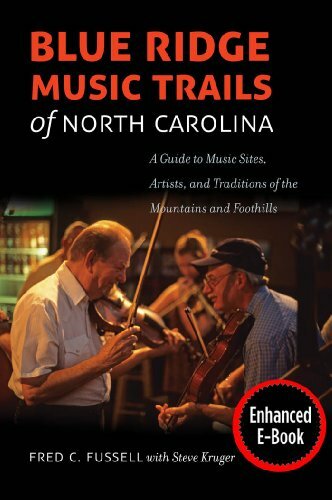 Notes are included in the book linking composer or performer to specific sections of Blue Ridge Music Trails of North Carolina. Blue Ridge Music Trails of North Carolina is an invaluable asset for anyone wanting to know more about traditional music and will serve as a very useful travel guide for those who wish to visit the region.